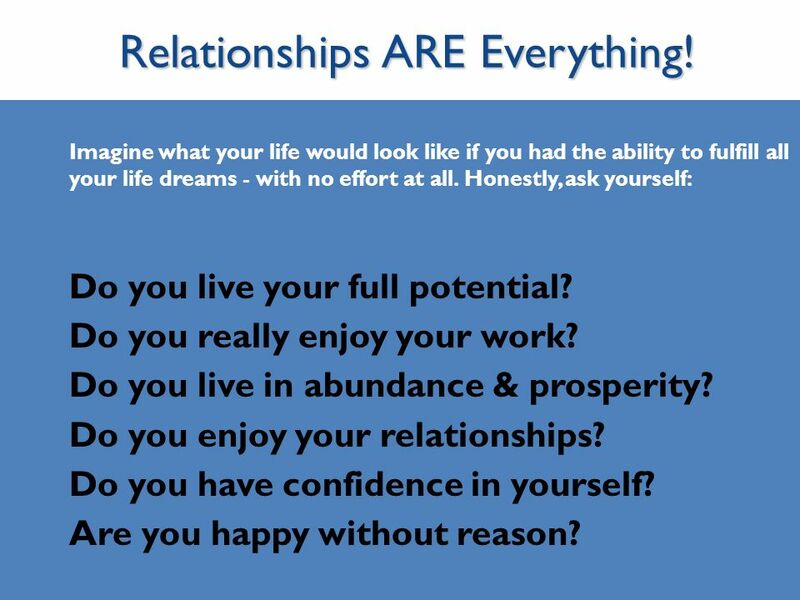 Imagine what your life would look like if you had the ability to fulfill all your life dreams - with no effort at all. Honestly, ask yourself: Do you live your full potential? Do you really enjoy your work? 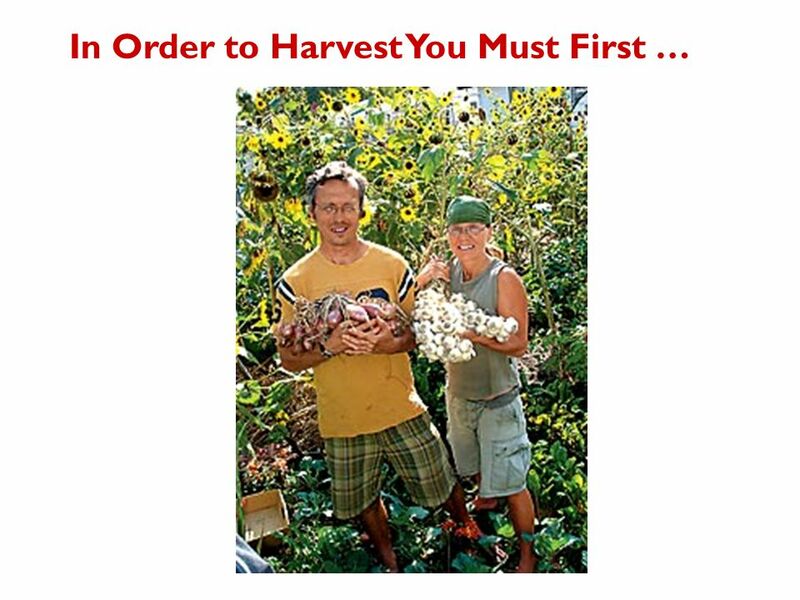 Do you live in abundance & prosperity? 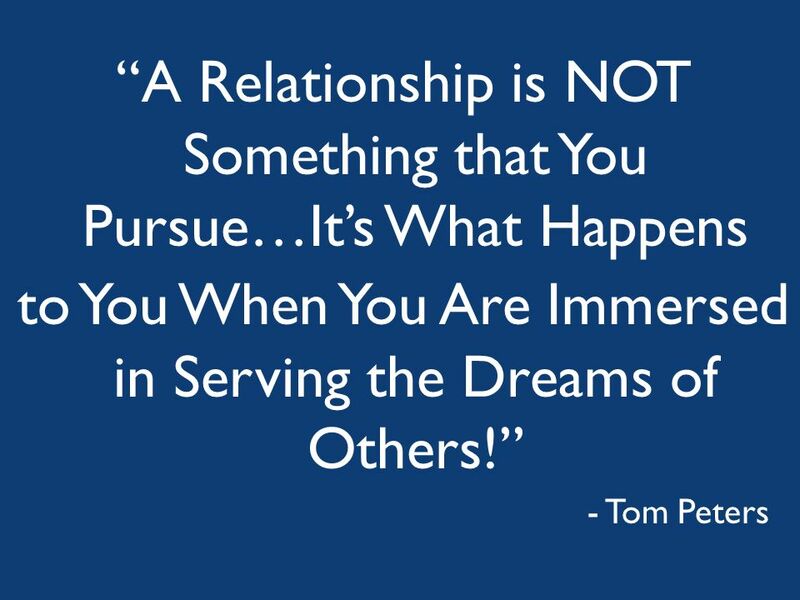 Do you enjoy your relationships? Do you have confidence in yourself? Are you happy without reason? 10 Reveal your personal talents, strength and potential with five unique exercises. Experience in every moment the excitement that you are the creator in your life. Free and expand your attention, and how focusing helps you make crystal clear decisions in life. 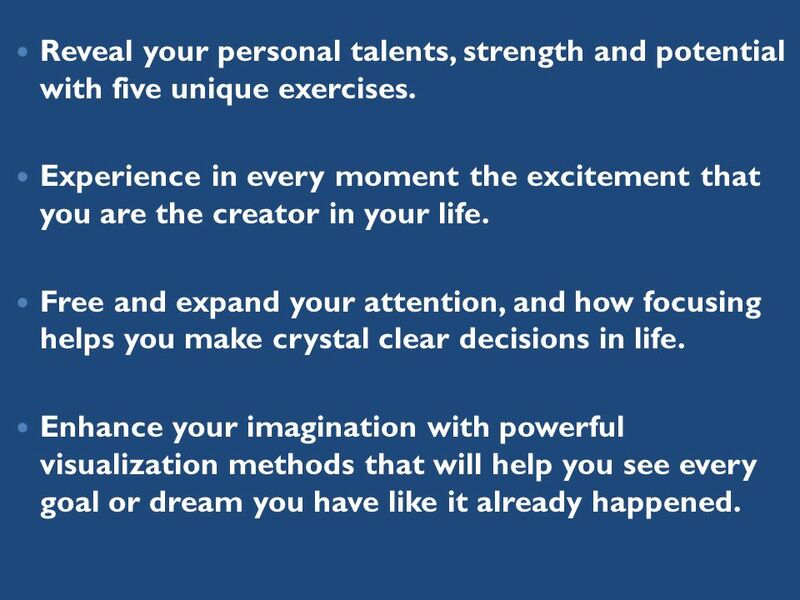 Enhance your imagination with powerful visualization methods that will help you see every goal or dream you have like it already happened. 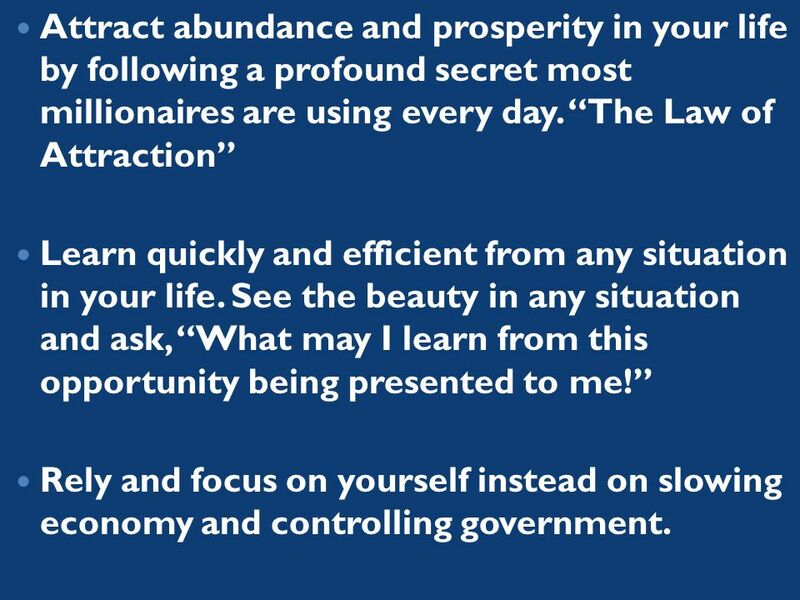 11 Attract abundance and prosperity in your life by following a profound secret most millionaires are using every day. “The Law of Attraction” Learn quickly and efficient from any situation in your life. See the beauty in any situation and ask, “What may I learn from this opportunity being presented to me!” Rely and focus on yourself instead on slowing economy and controlling government. 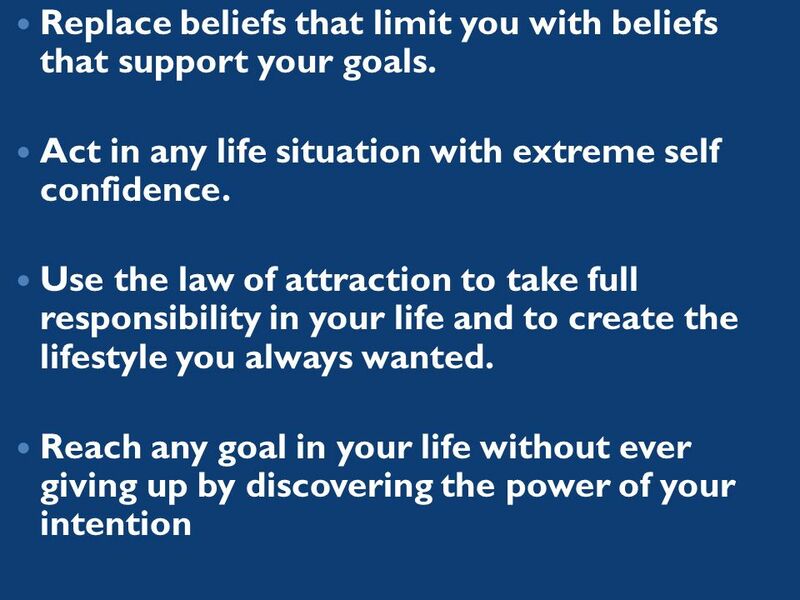 12 Replace beliefs that limit you with beliefs that support your goals. 13 "Begin with the end in mind." 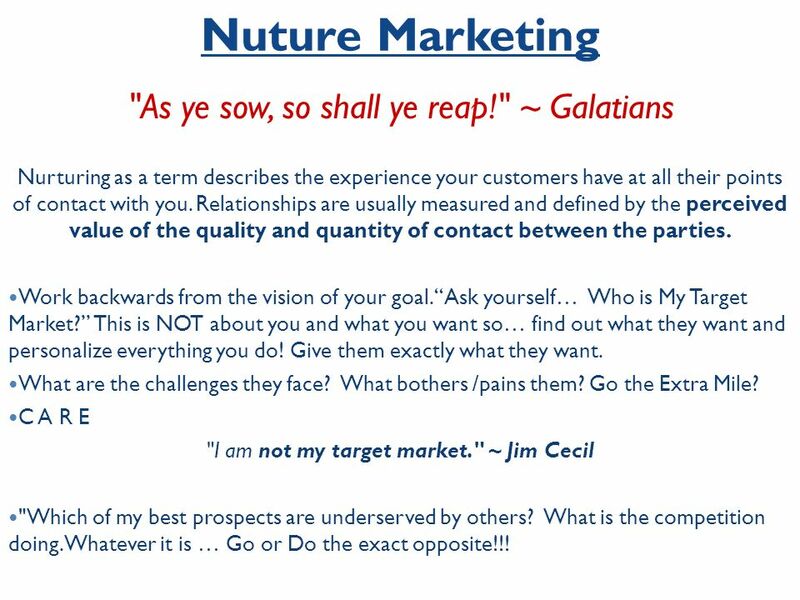 Nurturing as a term describes the experience your customers have at all their points of contact with you. Relationships are usually measured and defined by the perceived value of the quality and quantity of contact between the parties. Work backwards from the vision of your goal. 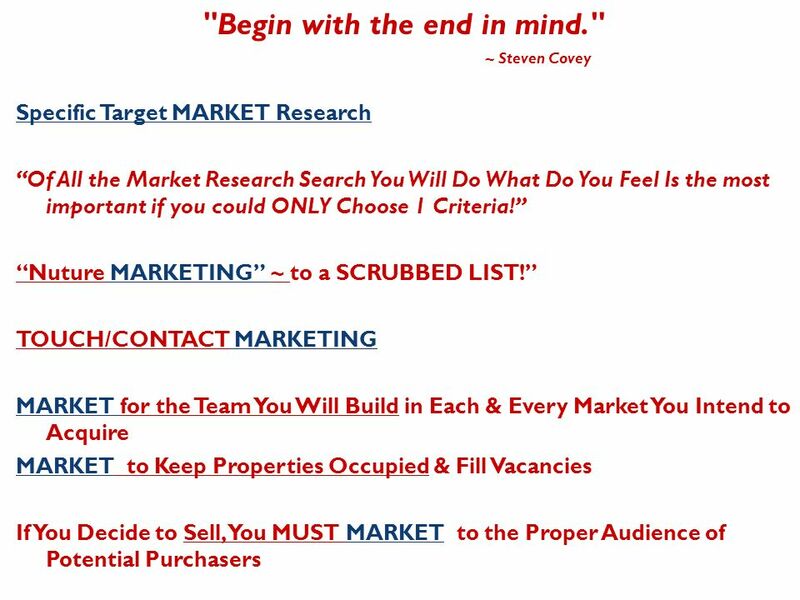 “Ask yourself… Who is My Target Market?” This is NOT about you and what you want so… find out what they want and personalize everything you do! Give them exactly what they want. What are the challenges they face? What bothers /pains them? Go the Extra Mile? C A R E "I am not my target market." 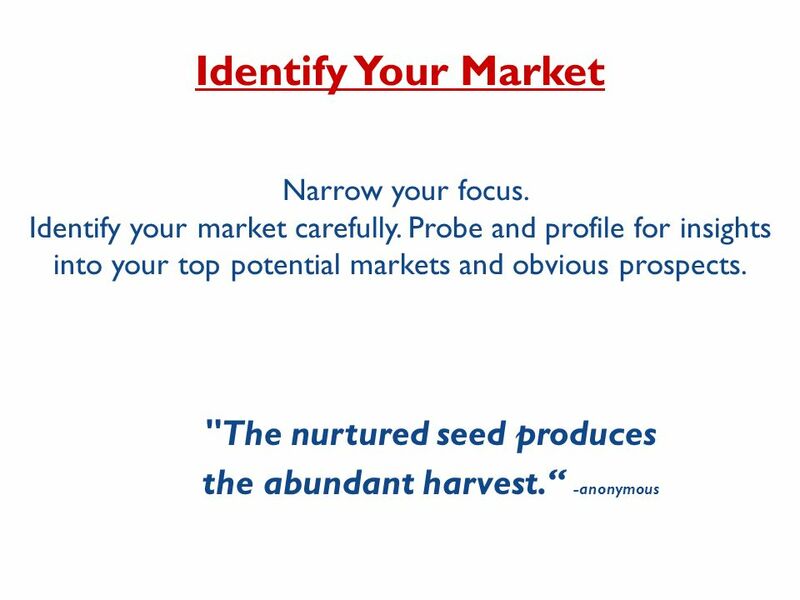 ~ Jim Cecil "Which of my best prospects are underserved by others? What is the competition doing. 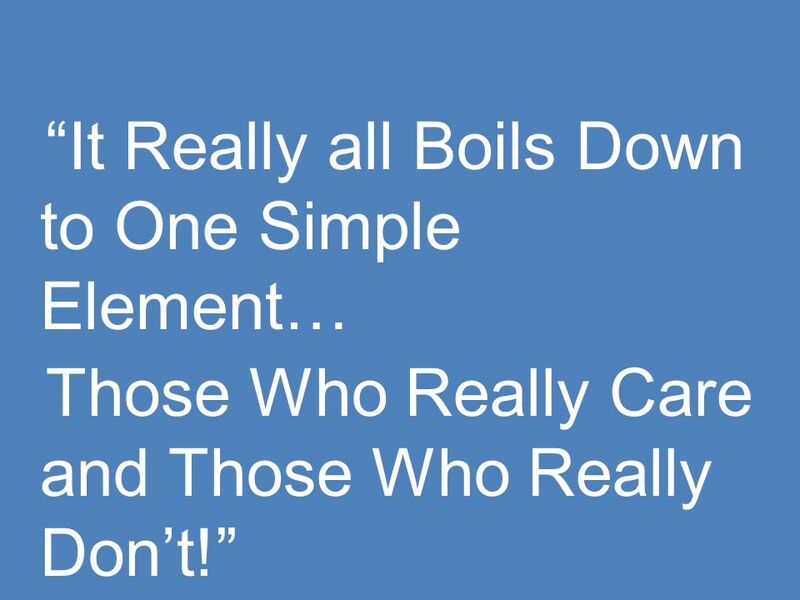 Whatever it is … Go or Do the exact opposite!!! 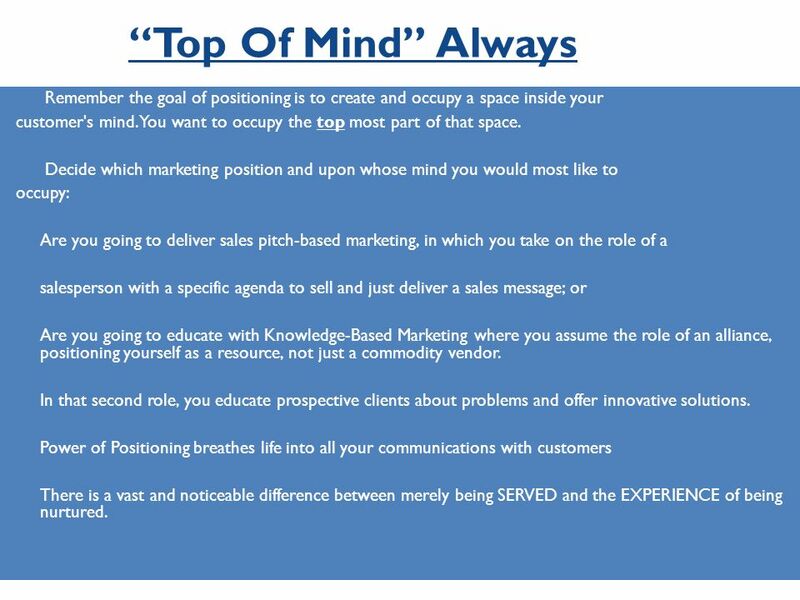 17 “Top Of Mind” Always Remember the goal of positioning is to create and occupy a space inside your customer's mind. You want to occupy the top most part of that space. Decide which marketing position and upon whose mind you would most like to occupy: Are you going to deliver sales pitch-based marketing, in which you take on the role of a salesperson with a specific agenda to sell and just deliver a sales message; or Are you going to educate with Knowledge-Based Marketing where you assume the role of an alliance, positioning yourself as a resource, not just a commodity vendor. In that second role, you educate prospective clients about problems and offer innovative solutions. 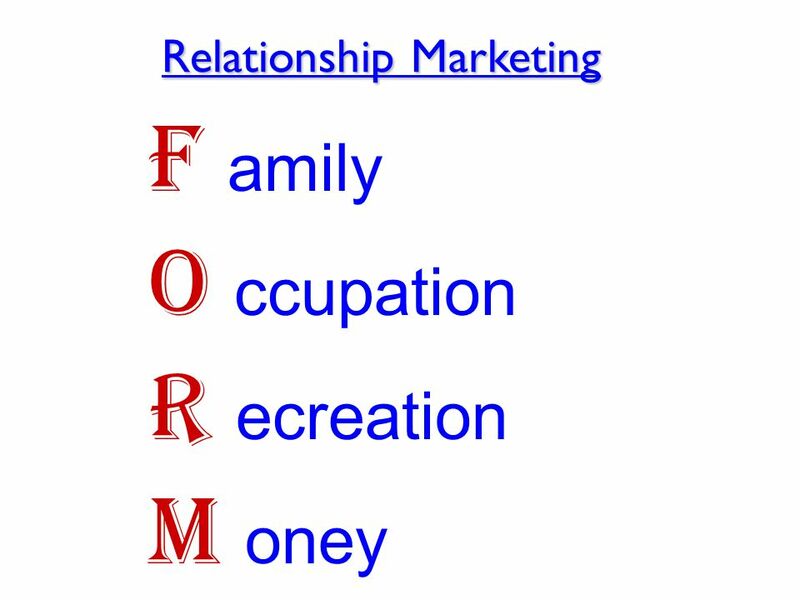 Power of Positioning breathes life into all your communications with customers There is a vast and noticeable difference between merely being SERVED and the EXPERIENCE of being nurtured. 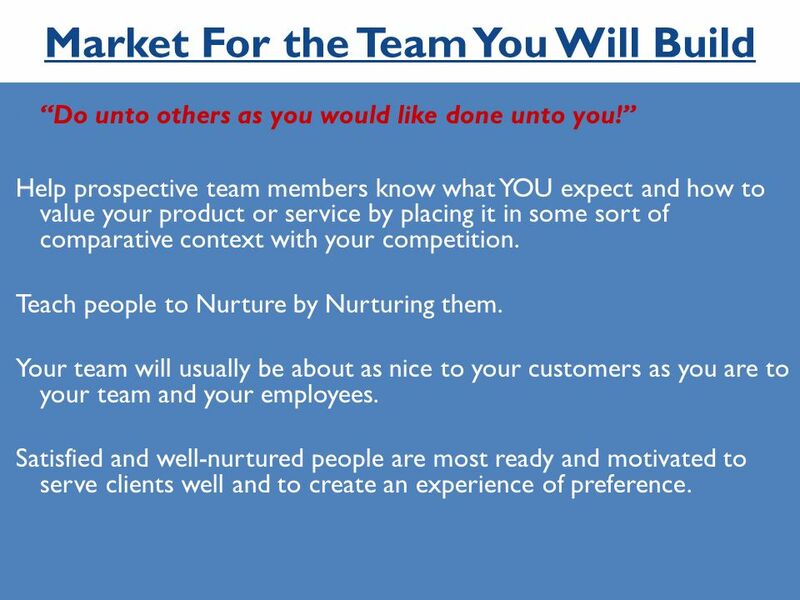 “Do unto others as you would like done unto you!” Help prospective team members know what YOU expect and how to value your product or service by placing it in some sort of comparative context with your competition. Teach people to Nurture by Nurturing them. 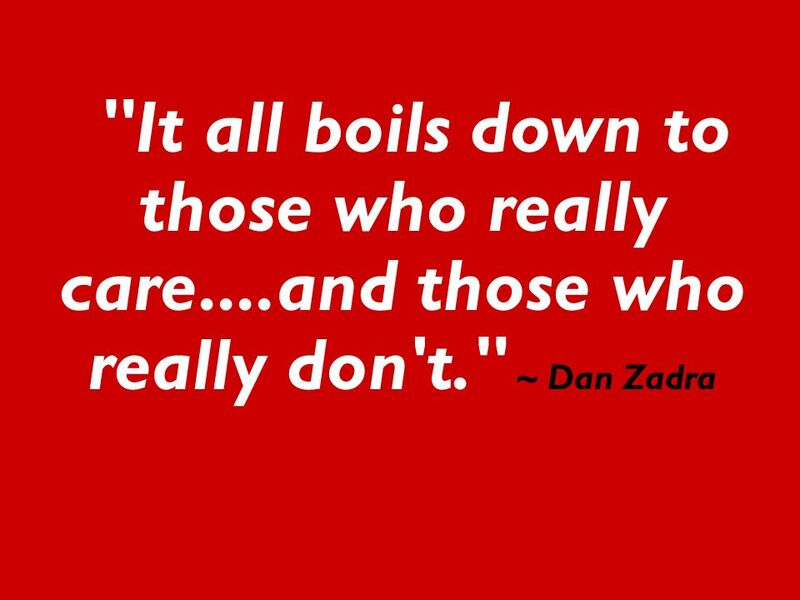 Your team will usually be about as nice to your customers as you are to your team and your employees. Satisfied and well-nurtured people are most ready and motivated to serve clients well and to create an experience of preference. "My green thumb came only as a result of the mistakes I made while learning to see things from the plant's point of view." 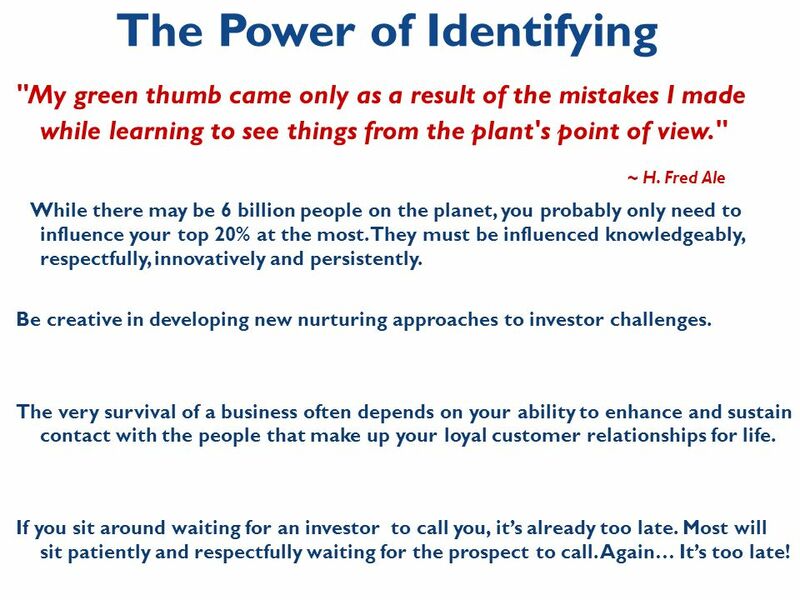 ~ H. Fred Ale While there may be 6 billion people on the planet, you probably only need to influence your top 20% at the most. They must be influenced knowledgeably, respectfully, innovatively and persistently. Be creative in developing new nurturing approaches to investor challenges. 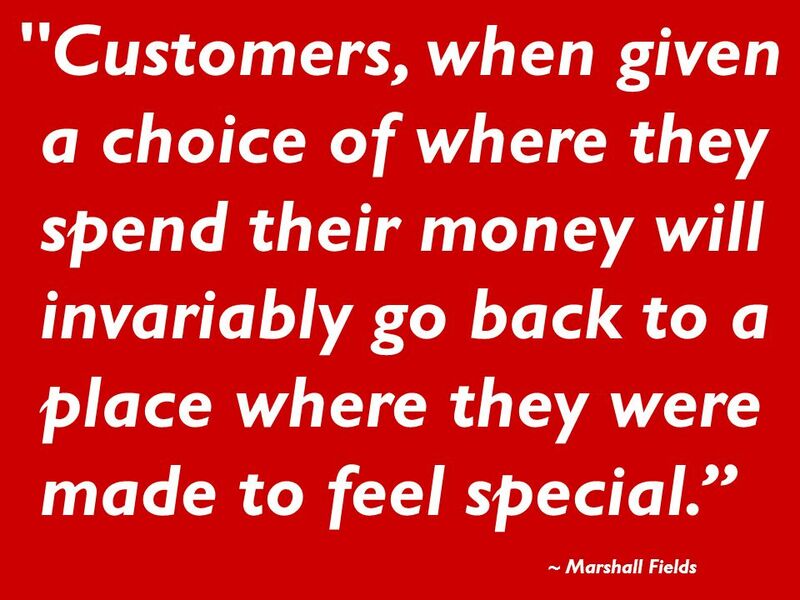 The very survival of a business often depends on your ability to enhance and sustain contact with the people that make up your loyal customer relationships for life. If you sit around waiting for an investor to call you, it’s already too late. Most will sit patiently and respectfully waiting for the prospect to call. Again… It’s too late! 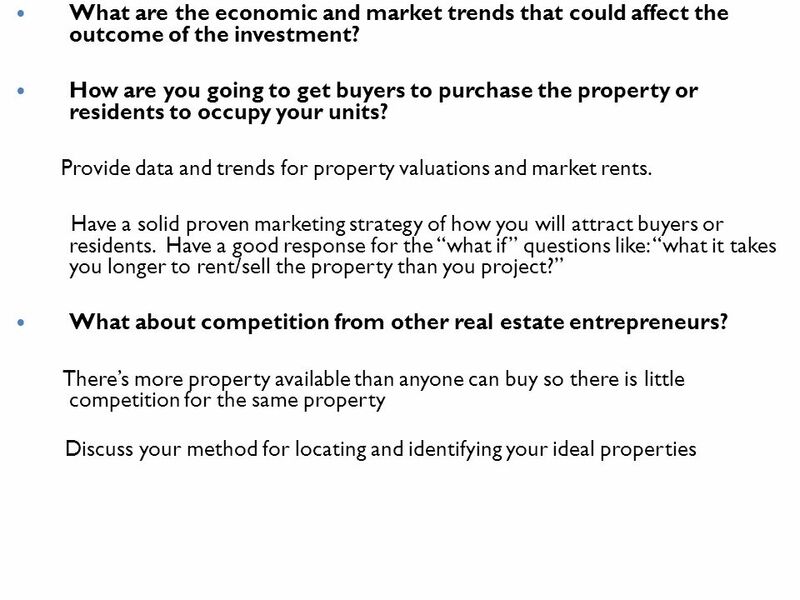 24 What about competition from other real estate entrepreneurs? What’s the return on investment? The answer will depend on who you are talking to and what their expectations are. Also, decide whether you’re offering promissory notes (interest payments) or equity share (% of the profit). Be aware – don’t offer interest payments unless the Cashflow from the property can always support it. Offering equity avoids the Cashflow problem and may be the only way to give investors the high returns. What will you do if you don’t meet the timelines you’ve set? Discuss how you will overcome potential risks and threats to the financial return for the investor if things don’t go as planned (increased carrying costs, lower price or rent, etc). What is your experience? Your business experience and background (awards, etc.) 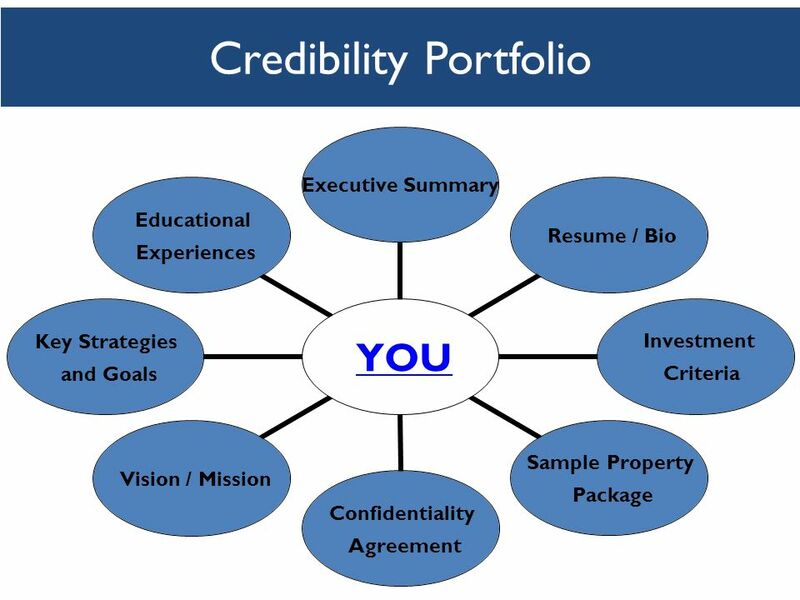 The courses you’ve taken and certificates you’ve earned The experience and credibility of your board of advisors. 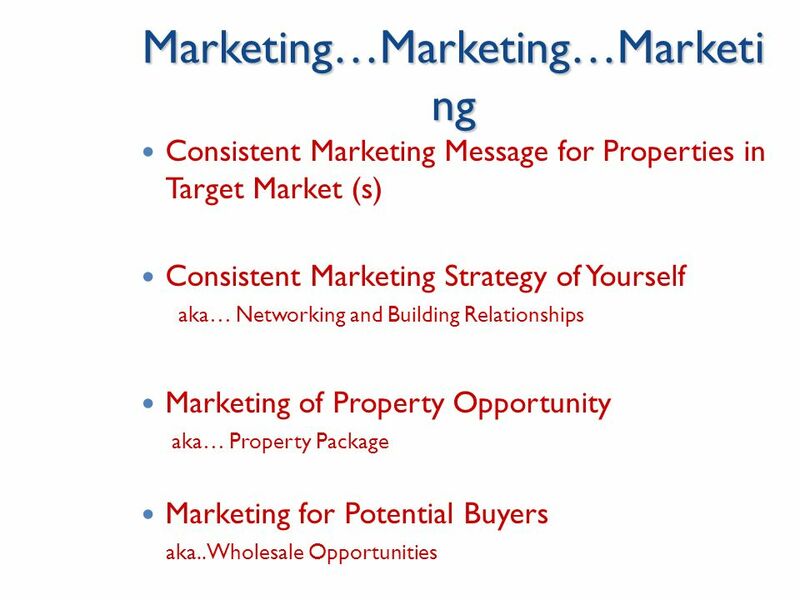 If you have successful real estate experience emphasize that too. 26 Why would I be a good investor for you? 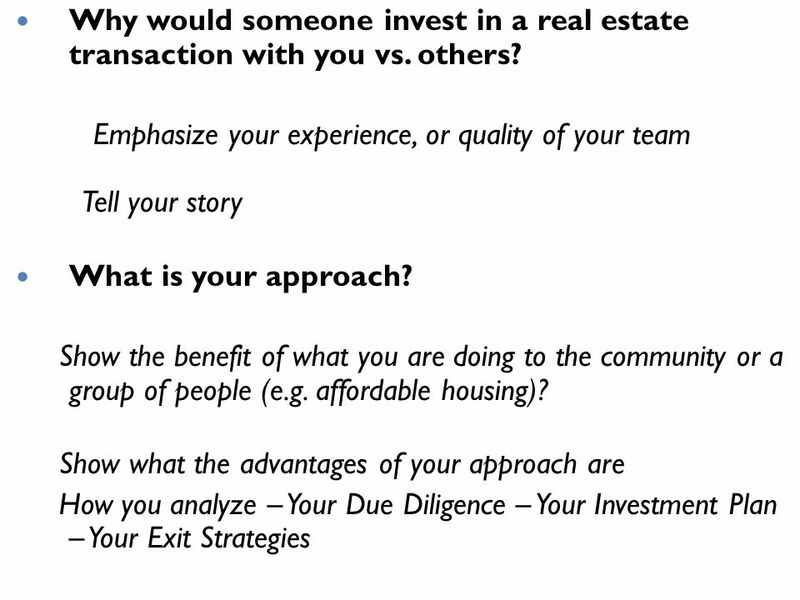 Often you will encounter investors that have experience investing in real estate. If so, be prepared to discuss how you will value you their input, and whether you are willing to share decision making authority (we recommend you avoid giving your invest decision making control—you should be the expert). 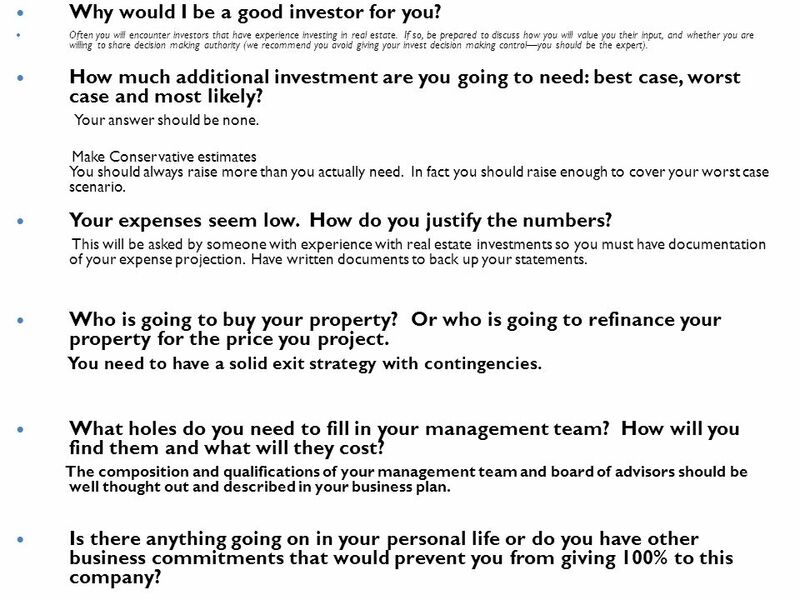 How much additional investment are you going to need: best case, worst case and most likely? Your answer should be none. Make Conservative estimates You should always raise more than you actually need. In fact you should raise enough to cover your worst case scenario. Your expenses seem low. How do you justify the numbers? This will be asked by someone with experience with real estate investments so you must have documentation of your expense projection. Have written documents to back up your statements. 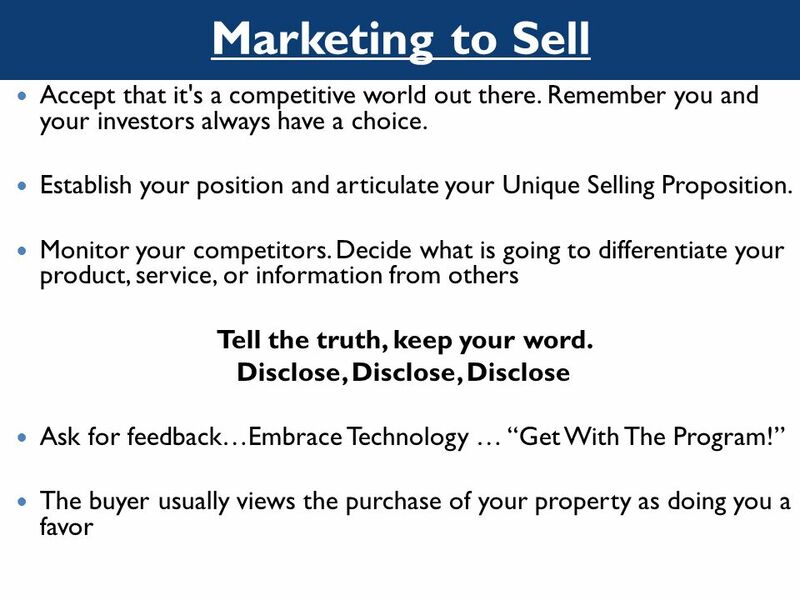 Who is going to buy your property? Or who is going to refinance your property for the price you project. You need to have a solid exit strategy with contingencies. What holes do you need to fill in your management team? How will you find them and what will they cost? The composition and qualifications of your management team and board of advisors should be well thought out and described in your business plan. Is there anything going on in your personal life or do you have other business commitments that would prevent you from giving 100% to this company? 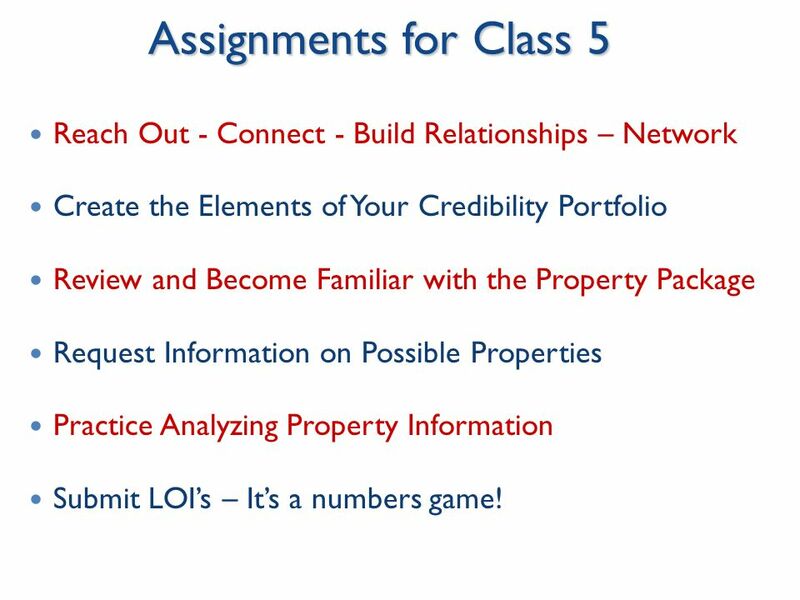 27 Assignments for Class 5 Reach Out - Connect - Build Relationships – Network Create the Elements of Your Credibility Portfolio Review and Become Familiar with the Property Package Request Information on Possible Properties Practice Analyzing Property Information Submit LOI’s – It’s a numbers game! 8 Ways to Sweeten Your bid to buy a business without paying more Sunbelt Business Brokers. DO YOU WANT TO BE AN ENTREPRENEUR?. WHAT IT TAKES Starting your own business may sound exciting, but it is not something to take on lightly. Do some soul. The 15 Minute Pitch. Slide #1: Introduction Slide Name of the company/project – with compelling tagline If appropriate -- Vision/Mission Business concept. 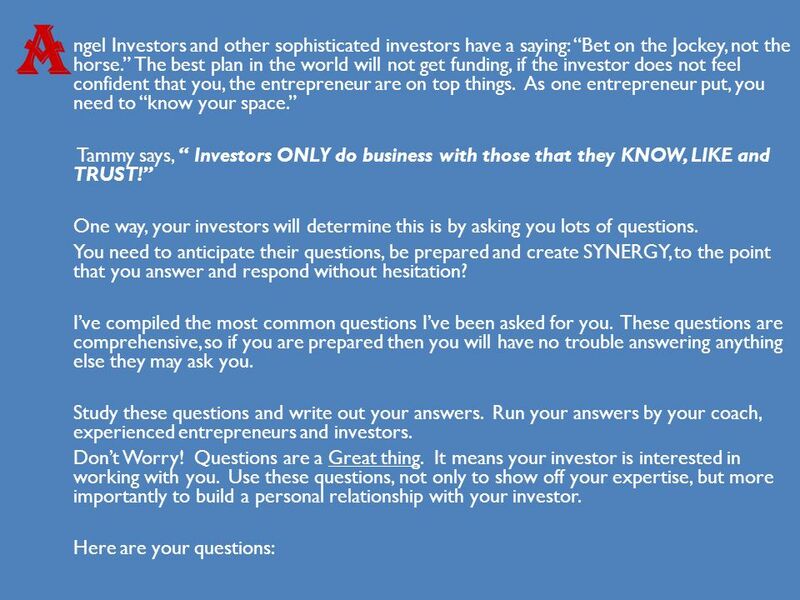 How to Pitch Your Company to Investors Presented by Community Capital New York Hudson River Ventures Orange County Business Accelerator July 30, 2014. USING THE ICP EXERCISE TO BETTER UNDERSTAND THE BUSINESS PLAN July 8, 2014 Kelley A. Packalen, PhD Associate Professor of Entrepreneurship, Queen’s School. This material is the property of GlobalSolve  Management Services and is not authorized for reproduction or distribution without the prior written approval. Chapter 13 Communicating the Opportunity. Objectives Target the business to investors. 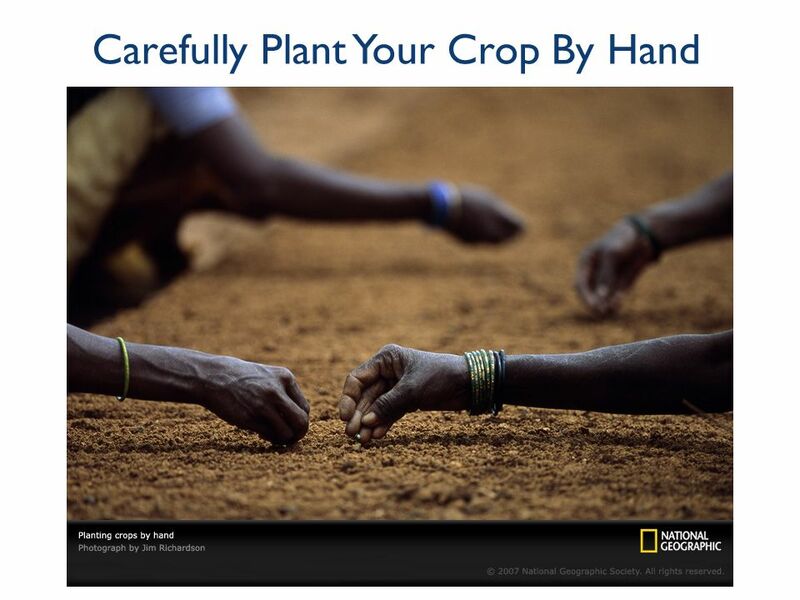 Prepare oral and visual presentation for investors. 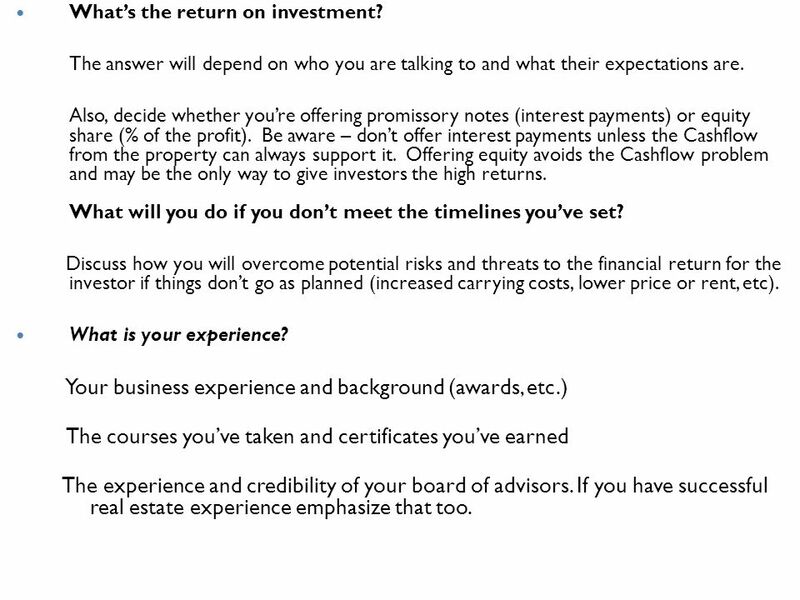 Investor evaluation. Intro To Business Ch. 5 Entrepreneurship. 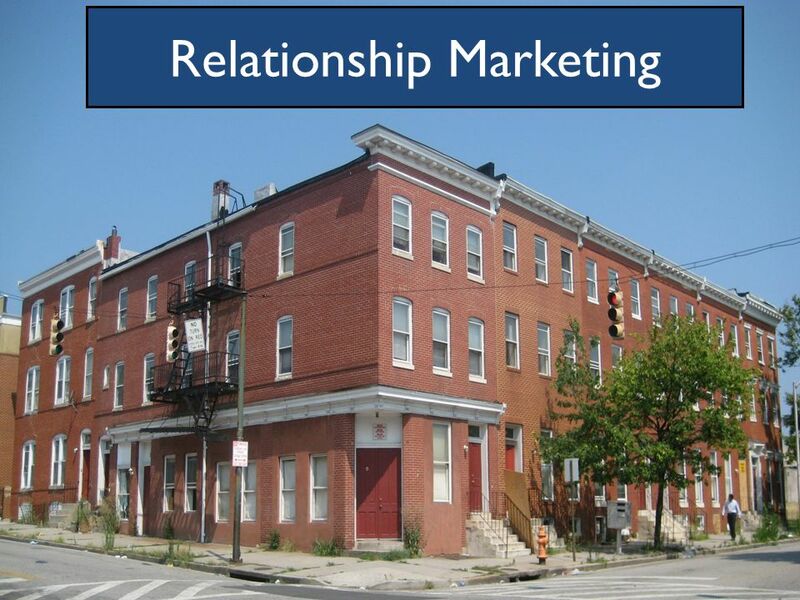 Acquire Foundational Knowledge Of Marketing Information Management To Understand Its Nature & Scope.